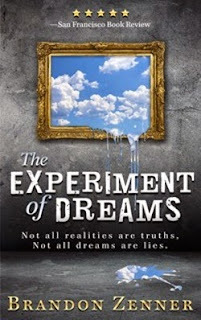 As part of The Experiment of Dreams blog tour, I'm happy to share this interview with author Brandon Zenner. I was born and raised in New Jersey, in a town named Red Bank. At around age 16, I started getting interested in writing, mostly due to my love of reading. To me, I see writing and reading as the ultimate form of freedom, where I can create whole worlds or get lost in someone else’s. To date, I have one full length novel published and several short stories. A novella and another full length novel are well underway. Outside of writing, I am a career bartender at a local Irish pub, where I have been serving drinks for the past 12 years. Describe the plot of The Experiment of Dreams in a few sentences. 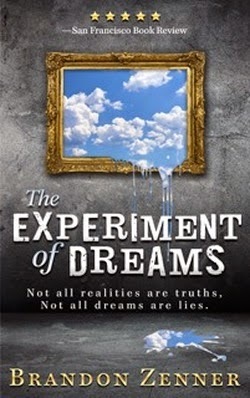 Okay, a few sentences … After a lifelong career of being a test subject, Benjamin Walker has taken a job on a project named Lucy; a machine that can record dreams in extreme detail. All is finally going well for Ben, until strange dreams of a town named Drapery Falls begin to plague him. The doctors and staff onboard team Lucy are not who they seem, and Ben will have to confront his own ailing mind in order to save his future. The most feedback I receive tends to come from people who are interested in lucid dreaming, or have experienced any sort of aura migraine (it’s rare, but people do suffer from it). Besides from that, I’ve received a lot of positive feedback from thriller lovers, as well as people who can appreciate something a little different. I get that a lot, that this book is different from the norm. What inspired you to write a story about a drug/sleep expert who gets involved with a mysterious project that is not what it seems? Hmm … that’s a tough one. I’m not exactly sure, to be honest. It might sound cliche, but I got the basic idea for the book from a dream. It was only a skeleton of an idea at first, but once I sat down and started writing, the rest of the plot seemed to fill in on its own. That was the most enjoyable part of the writing process, watching the story play out in my mind. It even surprised me at times. Have sleep and dreaming always interested you or did you just start looking into them in preparation for this book? They have always been an interest. As a teenager, I experienced lucid dreaming often, so it was easy for me to describe the feeling and imagery. As I’ve gotten older, I don’t lucid dream as much as I used to, but it does still happen once in a while. I also experience aura migraines, which is a strange and somewhat rare condition. It’s a migraine without much pain, but my vision gets overwhelmed by sparkling colors, and afterwards, it’s nearly impossible to carry a basic thought. When I was young, doctors told me the condition was similar to a stroke, but thankfully, they no longer believe that to be the case. Tell us a bit about the protagonist, Benjamin Walker. Ben is down on his luck, to say the least. He’s a depressed alcoholic, who can not get over the death of his wife for the life of him. He spends his days working a part time job, and works nearly full time doing strange sleep experiments and testing experimental medications. When the job opportunity to work on Lucy comes around, he is a natural fit. Ben can control his lucid dreaming on a scale rarely seen, which is essential when he is asked to recall certain things in his dreams (artwork, mostly … you’ll see why). Ben’s depression starts to lessen as his life improves, thanks in part to a lovely girl named Sophia who he meets in a Paris airport. But as the project goes on, Ben begins having strange dreams, and then, well … some very strange things begin happing to poor Ben. I try not to let other writers influence my style, but I’m sure it’s somewhat unavoidable. The writers who have influenced me the most, as a reader, would have to be: Kurt Vonnegut, Cormac McCarthy, Ken Follett, Charles Bukowski, and Jon Fante. There are more, but that’s a good start. Do you think your experience with short fiction influenced how you wrote your novel? Novels have always been my top priority. I wrote a few short stories in my early 20’s, but I have always had longer novel in the works. Particularly, a novel that I am currently finishing up, that I got the idea for when I was 16. The only problem was that I wasn’t a good writer at age 16, and the plot took a long time to fully mature (as did I). Do you use a computer, typewriter, or pen and paper when writing fiction? All three. I take a lot of notes on pen and paper before the writing process, but once the story is ready to be written, and my mind is feeling sharp, I use the computer almost exclusively. While I’m writing, I still take some notes, and I like to create timelines, which can make my desk look like it belongs in an insane asylum … depending on who you talk to, I might belong in the asylum with it. Right now I’m waiting for my longer novel to be returned from the editor. It’s about 550 pages, and set in a near future dystopian setting. Lot’s of fun things happen, like cannibalism, wars, etc.. I am also waiting for a novella to come back from a beta reader, which is a shorter, about 100 pages, crime fiction. A bit noire. On top of that, I have begun outlining my next novel, but I want be starting until I wrap up a few projects.